The main reason of course, is its excellent performance. 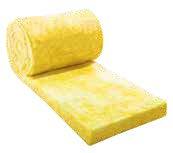 In terms of thermal and acoustic insulation, glass mineral wool meets ever-more testing demands and regulations easily. In terms of fire protection, Superglass products have been given a Reaction to Fire A1 (non-combustible) when tested to BS EN 13501-1 – the highest possible rating. Non-combustible is a legally defined term within the Building Regulations applicable to all regions of the UK and Ireland. Only materials achieving the highest standard of reaction to fire can be certified non-combustible. But glass mineral wool makes economic sense, too. Being ‘made to measure’, the material’s extremely easy and efficient to install; it’s supremely cost-effective, too. Add to that its long-term environmental payback – in a building’s lifetime you can expect to save up to 300 times more energy than is consumed in its manufacture and transport – and you have quite simply the best value solution available. Glass mineral wool is also breathable, helping to reduce the risk of condensation in the building – and you can always rely on it to consistently do what we say it does, matching its stated performance levels.